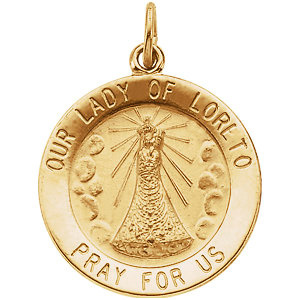 This round, die struck Lady of Loreto medal is made of polished 14kt yellow gold. Diameter: 22mm. Inscription: OUR LADY OF LORETO PRAY FOR US. This item is the size of a nickel and weighs 3.92 grams. Made in the USA.